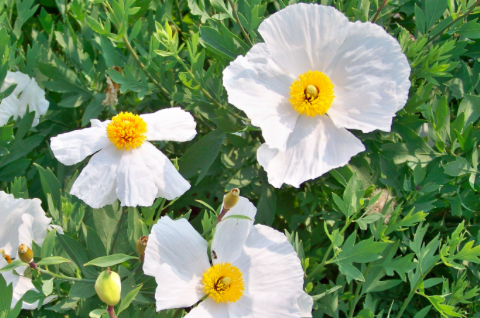 These are seed grown Matilija Poppies. They are very vigorous and will produce 5″ wide pure white flowers with a yellow center from June to September. Soft blue-gray foliage rises on 7′ stems which support the flowers. Full sun and very well drained soil and room to roam. Can travel many tens of feet in unobstructed space. Dies to the ground in winter. Cut back dead stems in spring when new growth emerges. Fried Egg Flower from Southern California. Moderate deer resistance. Wild areas, hillsides, the back 40. Spectacular in bloom.